The Commission on Genetic Resources for Food and Agriculture, in April 2013, considered draft strategic priorities for action on forest genetic resources and agreed on them as the Global Plan of Action for the Conservation, Sustainable Use and Development of Forest Genetic Resources (Global Plan of Action). Subsequently, the FAO Conference adopted the Global Plan of Action in June 2013. 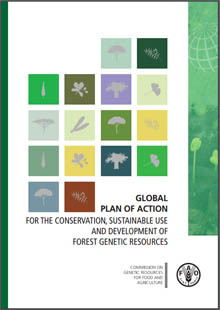 The strategic priorities of the Global Plan of Action were identified based on the information gathered for The State of the World’s Forest Genetic Resources and the recommendations made by the Intergovernmental Technical Working Group on Forest Genetic Resources in January 2013. The Global Plan of Action is voluntary and non-binding and should not be interpreted or implemented in contradiction with existing national legislation and international agreements where applicable. The relative priority of each strategic priority and associated actions may differ significantly in different countries and regions. Relative priority may depend on the genetic resources themselves, the natural environment or production systems involved, current management capacities, financial resources or policies already underway for the management of FGR.